Exercise 25 • Take a test tube and completely fill it with mercury. Invert it over a petridish which is also filled with mercury. There must be a continuous column of mercury in the test tube. • Tilt the test tube slightly and with the help of forceps introduce 3 - 4 healthy germinating gram seeds. • Gently tap the test tube with your finger nail/forceps so that the seeds move upwards in the mercury column. • With a clamp fix the test tube to a stand and keep the setup undisturbed for two hours. • Observe the setup. • Introduce 3-4 KOH pellets in the same way as seeds were introduced. Observe the changes. 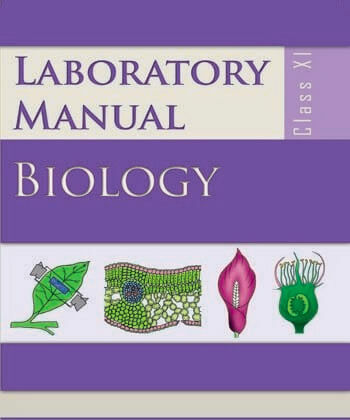 Laboratory Manual: Biology A space is formed at the top of the test tube due to downward displacement of mercury. When KOH pellets are introduced, the gap slowly disappears and mercury again fills up the entire tube. The germinating seeds respire in a situation when these are completely cut off from air in the presence of a continuous column of mercury. The carbon dioxide gas released gets collected at the top of the tube and displaces mercury. The CO released disolves in KOH and the mercury level rises again.2This establishes the fact that seed/buds have respired anaerobically. B. Phototropism Principle: Light is responsible for inducing many responses and physiological processes in plants. Light induced growth response in plants is called phototropism. Shoot is positively phototropic. Light controls the distribution of auxins in the shoot tip and a greater quantity of auxin accumulation occurs in the shaded portion leading to rapid cell division resulting in faster growth and the bending or curvature of the stem towards light. Requirement: Two herbaceous potted plant of same species, or seeds of mustard, an earthen pot filled with sandy soil, water. • Keep one potted herbaceous plant on a table near a window for a week and the other in the open space (Fig. 25.2). Water the plant, regularly and observe. OR • Germinate about 20-30 mustard seeds each in two pots. Keep one pot on a table near a window and the other in exposed open space. Water them daily. Observe the curvature of seedlings after a week in both setups. You will observe that the pots with plant/seed kept near window exhibit a distinct bending towards the light. The curvature or bending of shoot towards the source of light is due to the redistribution of auxins in the apical meristem of plants kept near the Exercise 25 window. The shoot/seedling kept in open space do not show any curvature. Shoots always exhibit positive phototropism. C. Apical bud removal (Apical dominance) Principle: Stem grows due to divisions of the apical meristematic cells situated at the tip of stem. Plants possess axillary (lateral) buds in the axil of leaves. The axillary buds are generally dormant and are not expressed because the apical bud imposes a natural inhibition over the growth of lateral buds. This influence exerted by the apical bud over the axillary buds is called apical dominance. Requirement: Two potted plants of same species with sparse branching- (Chenopodium/Croton/ Tecoma/Petunia/Hibiscus), knife/scalpel/blade. • Using a blade cut the tip of the stem of the experimental plant (plant A). Keep another plant of the same species without cutting its tip as control (plant B). • Water both the plants regularly and observe. After about 7-10 days, several lateral (axillary) branches will be seen in plant A as compared to plant B. When the apical bud is removed in plant A, the apical dominance no longer exists, as a result the lateral buds are activated and give rise to lateral branches. D. Suction due to transpiration (Transpiration pull) Principle: Transpiration refers to loss of water in vapour form from the aerial parts of plants. Transpiration develops a pull/upward suction force because of the presence of a continuous water column (formed due to cohesive and adhesive properties) that starts from the mesophyll cells of leaves (from where water is lost) to the root hairs (from where water enters the plants). This is called transpiration pull. This force is responsible for the absorption and upward conduction of water and minerals in the stem. Requirement: A healthy branch of a shrub or a tree (20-25 cm long), beaker (100mL) or a glass tube (15 cm long and 0.5 cm diameter), a rubber tube (8-10 cm long and 0.5 cm diameter), 50ml beaker, mercury, scalpel/knife, grease or petroleum jelly, tray, stand with clamp. Laboratory Manual: Biology Procedure • Insert a graduated 1 mL pipette to one end of a rubber tube so that it fits tightly. • Select a twig of appropriate diameter and size and make an oblique cut with a knife taking care not to rip off the bark. Moisten the cut edge with water. • Fill the rubber tube and pipette with water by suction. • Insert the twig into the other end of the rubber tube and tie a thread to make it air tight (Fig. 25.3). • Fix the set up with the help of burette Fig. 25.3 Experimental setup showing suction due to transpirationstand and clamp as shown in the Fig. 25.3. • Take a glass tube/beaker and fill it with coloured water (using eosin/methylene blue/blue ink) and keep the nozzle of the pipette in it. • Note the level of coloured water in pipette. Keep the setup in sunlight/under a fan for an hour and note the final level of coloured water in the pipette. Observation Initially when the experiment is set up, a continuous column of water is observed in the pipette. After an hour or so coloured water rises in the pipette. Discussion A strong suction force was developed in the water column due to transpiration from leaves. First a water potential gradient was created between the stomata and the spongy mesophyll. As a result of transpiration through stomata, water from the mesophyll moved into the stomata. A similar water potential gradient was built up sequentially from mesophyll cells - leaf veins- leaf midrib xylem - petiole xylem - stem xylem - water column in the experiment. The intense suction pressure generated sucked water against gravity. In nature this suction force is transmitted into the root xylem and root hair, which enables plants to absorb water from the soil. Questions 1. What other material could be used for demonstrating anaerobic respiration? 2. Would the same plant kept near the window respond similarly to artificial light? Exercise 26 Aim: To study the enzymatic action of salivary amylase on starch. Principle: An enzyme is a biological catalyst. The enzyme salivary amylase or ptyalin present in saliva initiates the breakdown of starch, which hydrolyzes it into disaccharide maltose, isomaltose and short chain glucose polymers called - dextrins. Enzymatic activity of salivary amylase can be tested by detecting the presence or absence of starch. Requirement: Glass wares: Test tubes, cavity blocks, beakers, dropper, and funnel; Chemicals: NaCl, Na2HPO4, KH2PO4, Iodine crystals, potassium iodide; Equipments: water bath or incubator thermometer; Miscellaneous - cotton, rubber, distilled water, test-tube stand, test-tube holder. Preparation of reagents (i) 1% starch solution: Add 1 g of soluble starch to 10ml of distilled water and mix them. Boil 90 ml of distilled water and to it add 10 mL of starch solution already prepared by stirring. Leave the solution overnight and then filter to get 1% starch solution. (ii) 1% NaCl solution: Dissolve 1 g of NaCl in 100 mL of distilled water. (iii) Iodine solution (Lugol's): Dissolve 1 g of iodine crystals and 2g of potassium iodide in 100 mL of distilled water. (iv) Preparation of buffer solution at pH 6.8: Buffer solution can be prepared by dissolving one buffer tablet of 6.8 or 7 pH in 100 ml distilled water or prepare M/15 Na2HPO4 solution (9.67g Na2HPO4 in 1000 ml of distilled water) and M/15 KH2PO4 solution (9.06g of KH2PO4 dissolved in 1000 ml of distilled water). Mix equal volume as per requirement to get buffer solution. • Take cotton soaked in distilled water. Remove the excess water by pressing and then spread the moistened cotton over the mouth of a funnel in such a way that it acts as a filter. After cleaning mouth, chew a piece of rubber/cotton and pour the saliva into the funnel. Saliva filtered through wet cotton will be collected in the test tube. Avoid using filter paper for filtering saliva. Take 1 ml of saliva and add 19 ml of distilled water to get saliva solution. • Take two sets of test tubes (8-10 test tubes in each set) in two separate test tube stand each containing 1 mL of iodine solution to Laboratory Manual: Biology act as indicator tubes. Mark them 1, 2, 3 . . .. in both test tube stands. • Switch on the electric water bath or oven. Set the temperature at 370C. Maintain uniform temperature (370C) of the water in water bath or water in a beaker inside incubator throughout the experiment. • In a test tube, take 10 ml of starch solution, 2 ml of 1% NaCl solution and 2 ml of buffer solution. Mix them well and transfer half of the solution into another test tube. Mark one test tube as experimental tube and the other as a control tube. • Now transfer both experimental and control test tubes to the water bath or keep them in the beaker containing water inside incubator for about 10 minutes so that temperature of solutions reaches 370C. • Add 1 ml of saliva solution to the experimental tube and 1ml of distilled water to control tube. Keep both tubes in water bath/ incubator throughout experiment. • With the help of a dropper, take a drop each from experimental and control tubes and pour it into two separate indicator tubes (marked 1) containing iodine (from two series of indicator tubes one for experimental and other for control). Record the time of mixing as zero minute reading and note the change in colour of iodine in both tubes. • After two minutes, again transfer a drop each from experimental and control tubes to indicator tubes (marked 2) and note the colour of iodine. Repeat the step at interval of every two minutes till the colour of iodine solution does not change any further (achromatic point). Always take the same amount of solution throughout the experiment to be added to iodine tubes. • Compare the series of experimental tubes with the control iodine tubes. Time (Min) Indicator tube Control Indicator tube Experimental 0 Blue colour 2 ____________ 4 ____________ 6 ____________ ___ ____________ ___ ____________ ___ ____________ Exercise 26 (i) Note the colour in control indicator tubes. (ii) Note the colour change in both test tubes and the time taken for the change. (iii) Perform the Benedict's test for confirmation of the presence of reducing sugar. On the basis of following questions draw your conclusion: • Did the colour change occur in both sets? • Which set showed colour change and why? • Which set did not show colour change and why? • Which set showed positive Benedict’s reaction and what does it confirm? • How much time did it take to reach the achromatic point (no change in the colour of the indicator)? Exercise 27 Aim: To study the effect of temperature on the activity of salivary amylase. Principle: Most of the enzymes are proteinaceous in nature. Over a limited range of temperatures, the rate of enzyme catalyzed reactions increases as temperature rises. The rate of many biologic reactions roughly doubles with a 100C rise in temperature and is halved if the temperature is decreased by 100C. There is an optimal temperature at which the reaction is most rapid. Above and below this, the reaction rate decreases sharply. Requirement: Glass wares: test tubes, cavity block, beakers, dropper, funnel, test-tube stand, test-tube holder; Chemicals: NaCl, Na2HPO4, KH2PO4, Iodine crystals, potassium iodide, Prepared Reagents as in Experiment 26; Equipments: water bath or incubator, thermometers; Miscellaneous - cotton, rubber, distilled water, The first four initial steps are the same as in previous Experiment 26. • In a beaker, take 15 mL of starch solution, 3 mL of 1% NaCl solution and 3 mL of buffer solution. Mix them thoroughly. Divide the solution into three test tubes and mark them as A, B and C. All three test tubes are experimental tubes. • Now transfer experimental tube A into a beaker containing ice and a thermometer for recording temperature. Temperature of this beaker is to be maintained at 50C. Transfer the second experimental tube B into water bath set at 370C and the third experimental tube (C) into the beaker maintained at 700C. • Without taking them out add to the three experimental tubes (A, B,and C), 1 mL of saliva solution. • Take a drop from each of the experimental tubes with the help of a dropper and add it to the corresponding indicator tubes containing iodine solution. Note this time as zero minute reading. • At intervals of every 2 minutes keep on repeating the above step and note the change in colour of iodine solution. Continue this till the colour of iodine does not change. • Note the time taken for different experimental tubes till they do not give any colour with iodine. Exercise 27 To digest completely 5 mL of 1% starch solution, 1 mL of diluted enzyme takes ------- minutes at 50C, ------- minutes at 370C and -----minutes at 700C. Time minute Reaction with iodine Reaction with iodine Reaction with iodine from experimental tube A from experimental tube B from experimental tube C 0 Blue colour Blue colour Blue colour 2 4 6 8 10 12 ____ ____ ____ On the basis of the following questions draw your conclusion: • At which temperature the reaction is optimum? • Did all three sets of tubes reach achromatic point? If not, why so? • What inference do you draw about enzyme activity from your experiment?